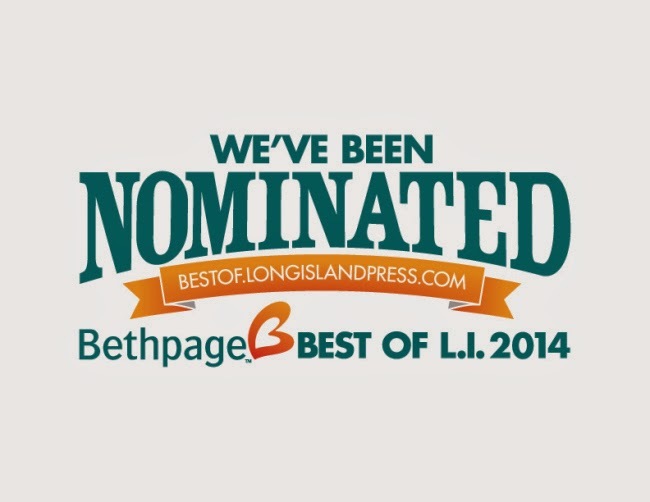 The Law Office of David Galison, P.C., proudly announces the nomination for Best Law Firm of Long Island for 2014! I would personally like to thank each and every client who nominated the Law Office David Galison, P.C., for this very prestigious award. 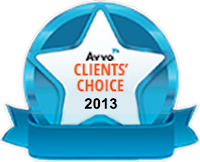 As most clients know it is my goal to obtain the best results for each and every client on each and every case. When I take on a new client I do so with the intention of not only handling the matter for which I was retained, but also with the intention of maintaining this new relationship for years and years to come. 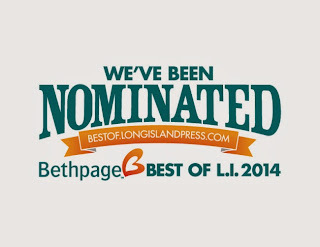 In order to cast your vote and make the Law Office of David Galison, P.C., the winner of the 2014 Best Of Long Island Law Firm Award please follow the steps below. Click on this link below. When the window opens, Click on the Services Button for category. 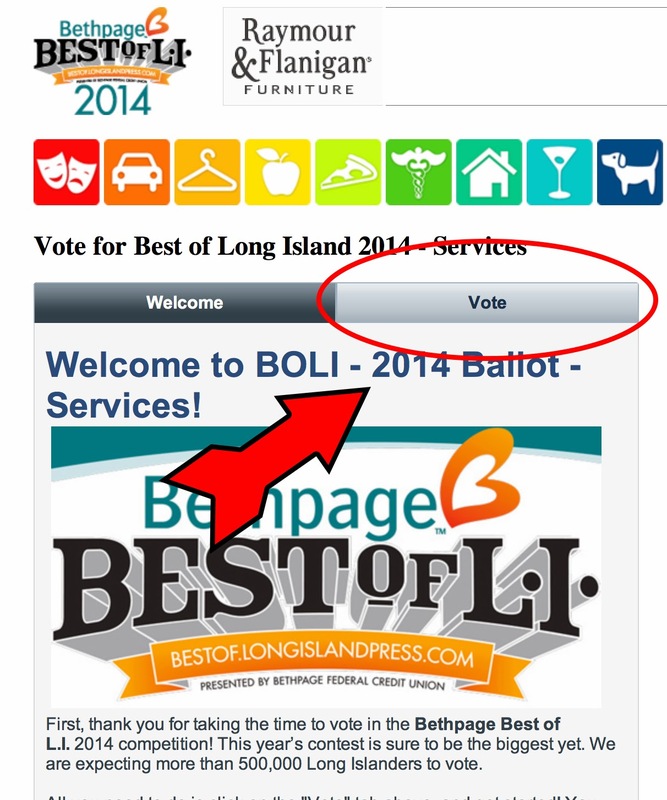 When the window opens, Click on the Box that has the words VOTE on the top right. 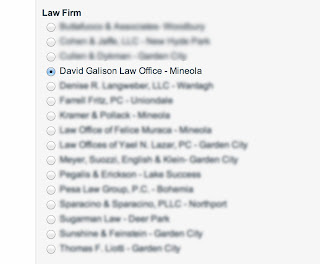 When the window opens scroll down to LAW FIRMS and click in the circle next to David Galison, P.C. 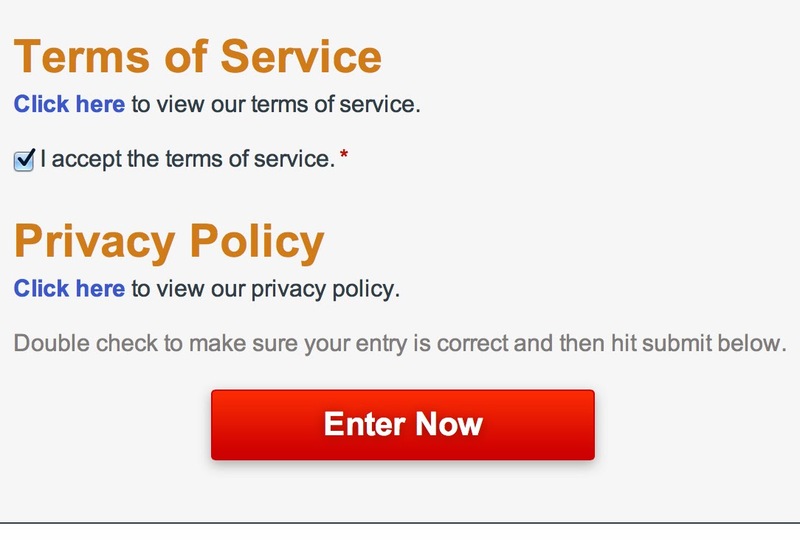 Red box that says "Enter Now", that it! Thank you for taking the time to cast your vote. You can vote every day until 12/15/13 so feel free to vote every day if you wish. DWI In Nassau County New York. Breath Testing Instruments - Things to Consider - What the Police, Court and DA Doesn't Want You To Know. In New York State, a person can be charged with Driving While Intoxicated pursuant to section 1192.2 of the Vehicle and Traffic Law if they operate a motor vehicle while having .08% or more of alcohol in their blood as shown by chemical analysis of their blood, breath, urine or saliva. As can be seen from the above trusting Breath Testing Devices can result in false convictions. It is my opinion that only a blood test will accurately indicated what a person’s true blood alcohol content is. 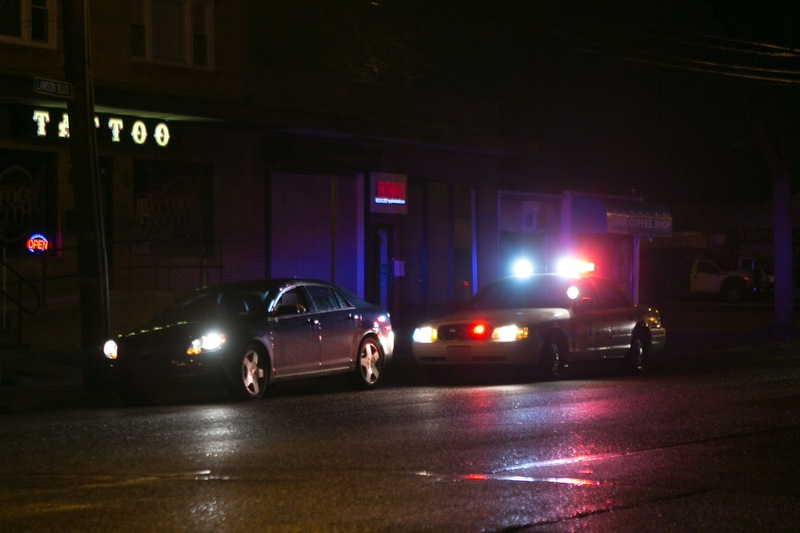 This is only the first part of a series of articles that will be published addressing deficiencies in the prosecution of DWI cases on Long Island. 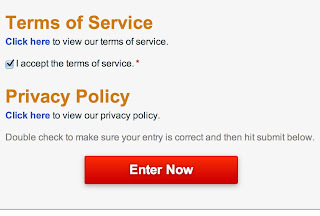 Please bookmark this page and check back periodically as updates will continue. 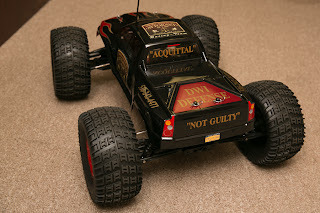 You won’t believe how many flaws there are in the DWI prosecutorial machine known as NY DWI. Driving while intoxicated; per se. No person shall operate a motor vehicle while such person has .08 of one per centum or more by weight of alcohol in the person's blood as shown by chemical analysis of such person's blood, breath, urine or saliva, made pursuant to the provisions of section eleven hundred ninety-four of this article. I was recently asked to speak at the St. John's University School of Law, Frank S. Polestino Trial Advocacy Institute, in connection with the J. Walter McKenna Forum on Changing Gun Laws in New York: Prevention Versus Protection. 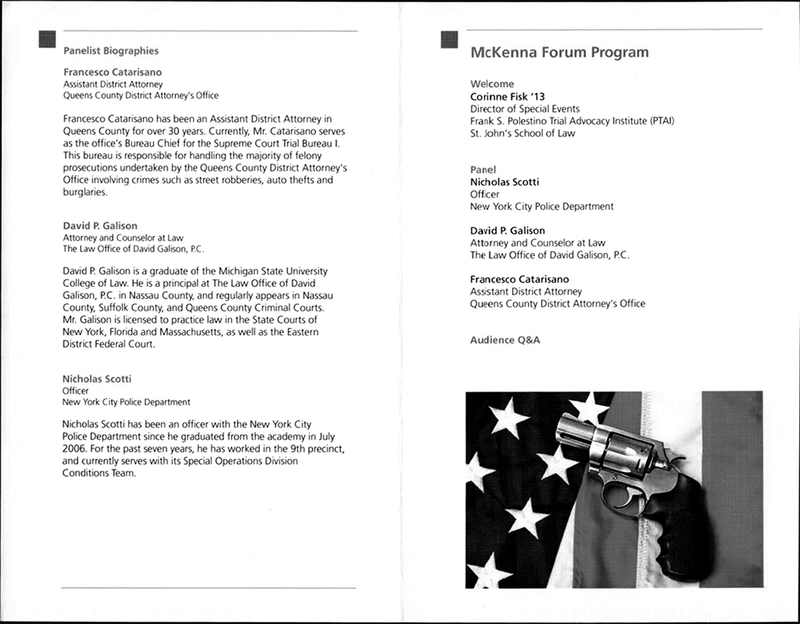 The event was hosted by Corrine Fisk and co-paneled by Nicholas Scotti of the New York City Police Department and by Francesco Catarisano, Esq., a Bureau Chief in the Queens County District Attorney's Office. My fellow panelists were extremely knowledgeable about the gun laws in the state of New York and the night provided for an excellent discussion regarding the current gun laws in effect and what impact if any would be achieved by further revisions. It was a pleasure being placed on the panel with both Mr. Scotti and Mr. Catarisano both of whom were excellent speakers and shared many insights and personal experiences. 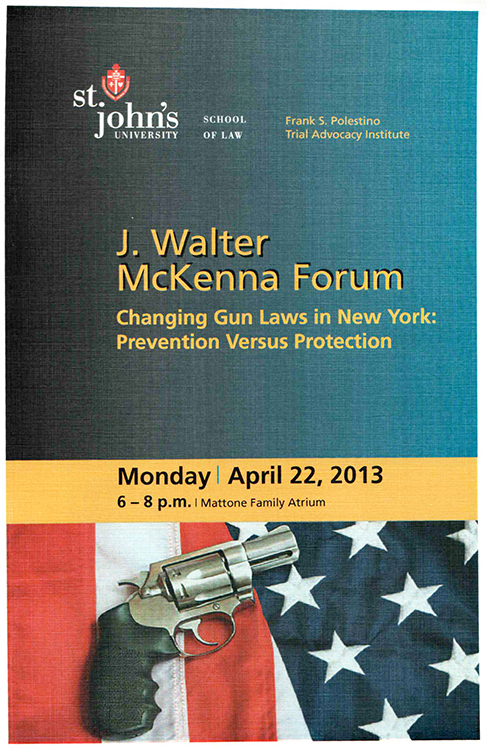 I thoroughly enjoyed the forum and would like to thank St. John's University School of Law for inviting me to speak. Many people know that my office handles traffic violations such as speeding tickets and DWI cases, but most are unaware of the fact that I handle felony gun charges as well. 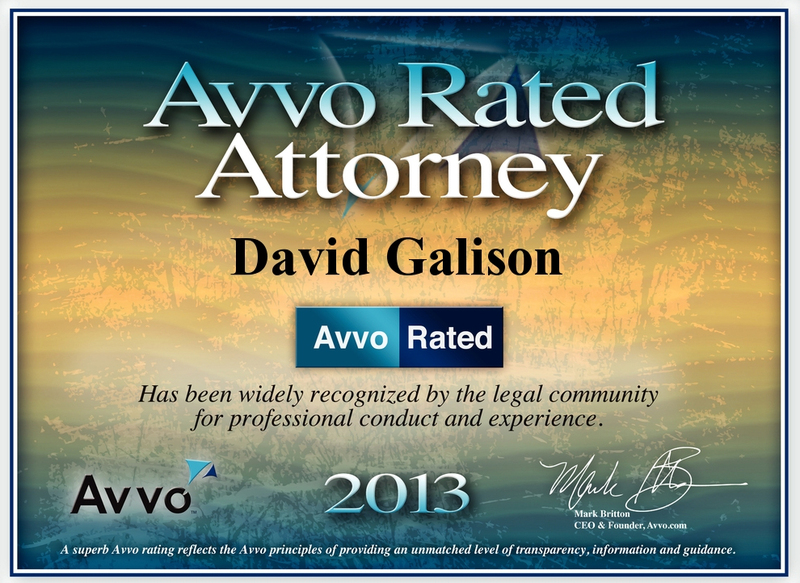 At law office of David Galison, P.C., all criminal charges both felony and misdemeanors are rigorously defended. A more detailed understanding of the areas of my practice can be found at; CriminalAttorneyNassauCounty.com or at TrafficTicketAndCriminalDefense.com. Hiring the right attorney to handle your moving violation can be a difficult decision. Speeding tickets, stop sign tickets, red light tickets, and all other moving violations can put points on your license causing your insurance premiums to go up for years to come. In addition too many points can cause your license to be suspended or even revoked by the NYS DMV. 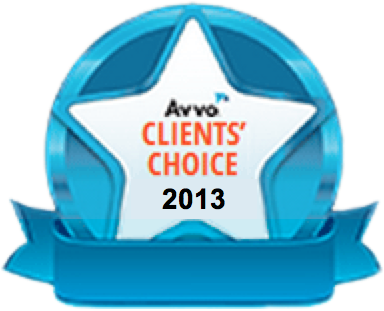 In order to help clients feel comfortable about choosing the right traffic ticket lawyer I have created a link to Avvo.com which is an attorney referral website. I have started to ask clients to list reviews of my services online. There are several reviews up already and they are extremely complimentary. 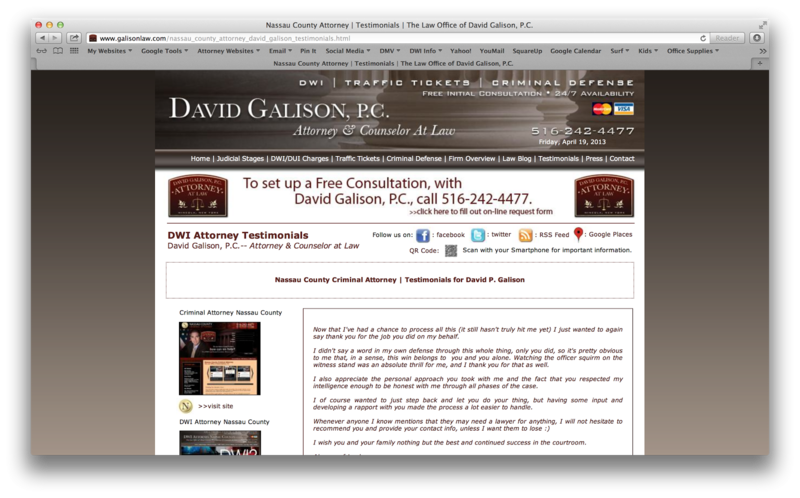 I have also attached a Link to the Galison Law website where additional reviews can be found regarding traffic tickets, DWI cases, and other criminal charges. 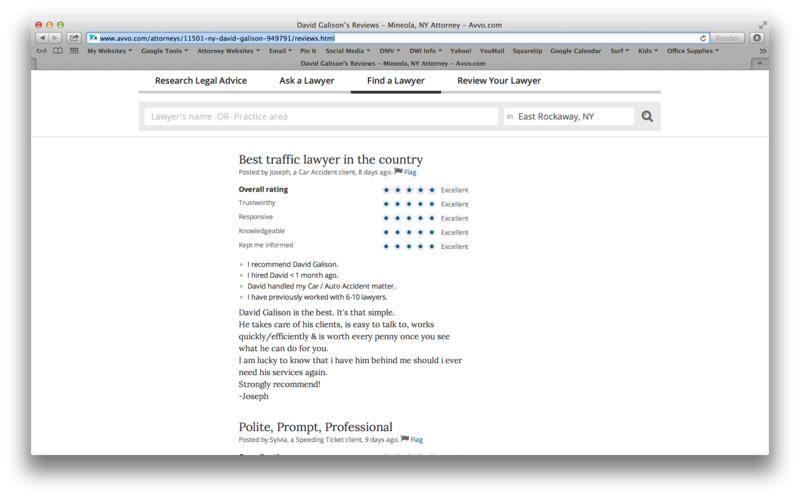 I hope that the above helps you in your selection of choosing the right attorney to help you handle your Long Island traffic ticket. 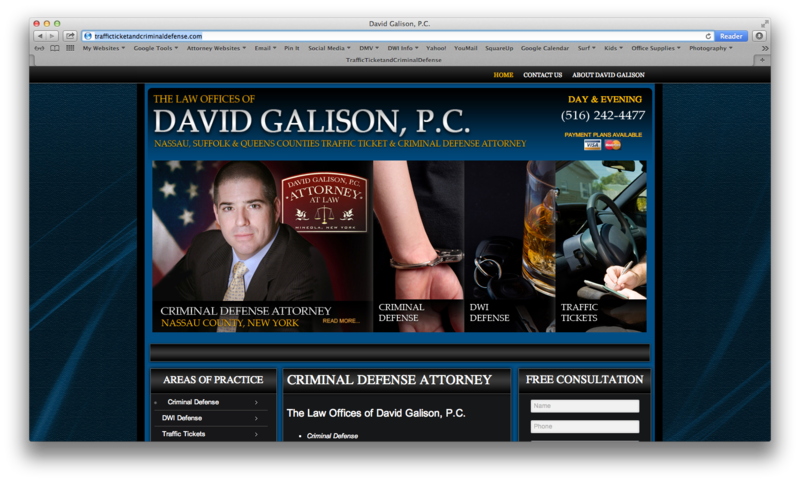 At the Law Office of David Galison, P.C., traffic ticket defense is taken extremely seriously. 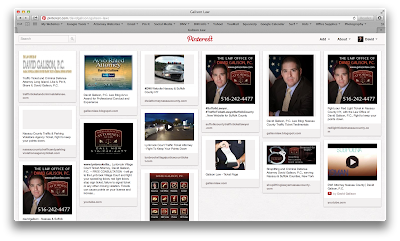 The Law Office of David Galison, P.C., is proud to announce the Traffic Ticket and Criminal Defense Pinterest Page. This webpage site will focus on both Traffic Ticket and Criminal Defense postings related to Nassau, Suffolk and Queens counties. As many readers are already aware the Law Office of David Galison handles all traffic ticket matter including but not limited to; speeding tickets, stop sign tickets, failure to signal tickets, tailgating tickets, reckless driving tickets, DWI and DUI, and all other Vehicle and Traffic Law offenses. And of course if you should need a criminal defense attorney to handle your Nassau, Suffolk or Queens county criminal case we handle that to. 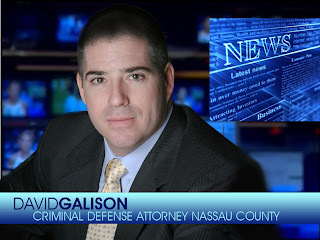 For well over a decade the Law Office of David Galison has been handling criminal cases such as; possession of drugs, sale of drugs, driving on a suspended or revoked license, larceny, shoplifting, menacing, DWI and DUI, resisting arrest, possession of a weapon, and all other NYS Penal Law charges. 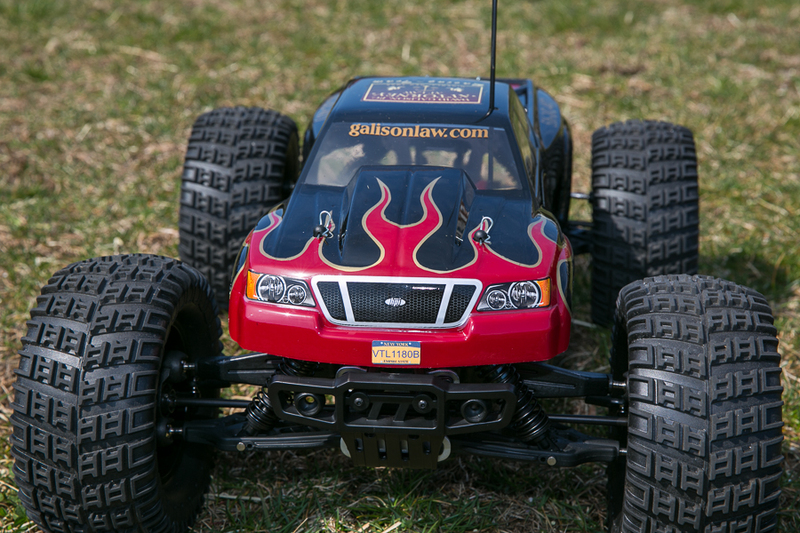 Shown below are pictures of the Galison Law Thunder Tiger MT4-G3 Racing Truck. 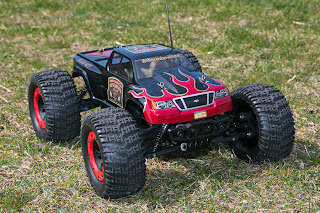 The Xtremely cool guys at Xtreme Hobbies created this for my office as a display. I never thought that I would actually play with it, but what can I say, it looks so awesome I had to try it. 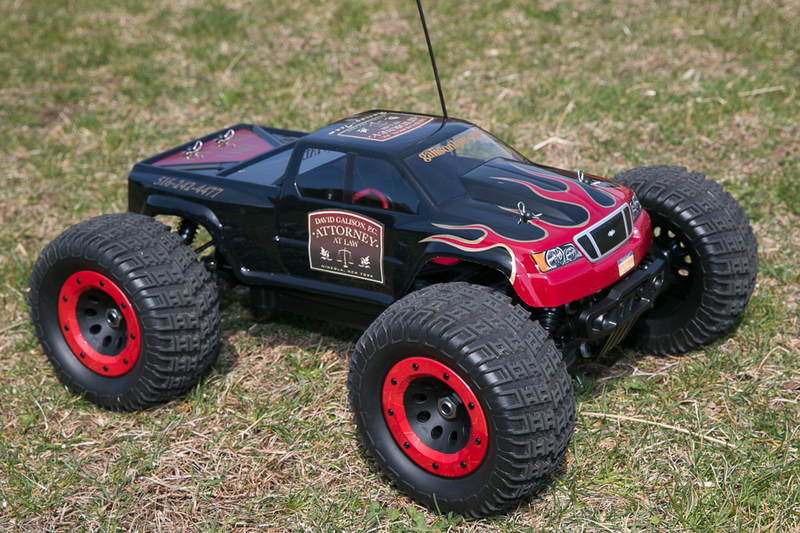 Fast, fast, fast, I almost got a ticket on the steps of the Nassau County Legislative Building playing with it. I love it!! 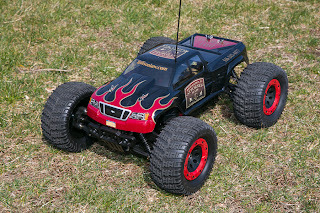 Be sure to visit the Xtreme Hobbies Facebook Page and Like It. 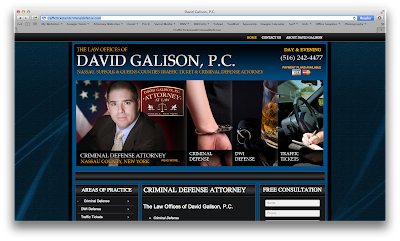 The Law Office of David Galison, P.C., is proud to announce a new website devoted to traffic tickets and criminal defense. The new site provides information on almost all traffic ticket violations in New York in addition to a detailed pages on criminal charges as well. 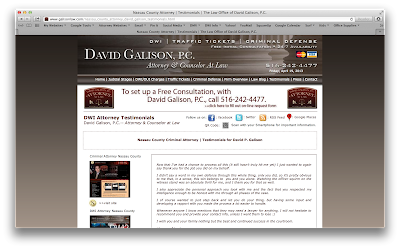 As many of you know the Law Office of David Galison, P.C., offers Free Consultations on all traffic ticket and criminal defense cases. 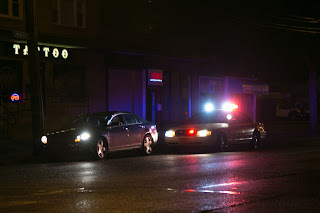 We handle all moving violations from speeding, running a stop sign, passing a school bus, DWI and DUI to driving on a suspended license and reckless driving. In most instances your case can be handled without your appearing in court. 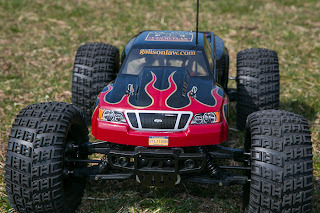 Please visit the site and let us know what you think. 2013 is well under way and the Nassau County Police are out in full force writing tickets. The police have been issuing moving violations for speeding, failure to yield, following too closely (tailgating), running a red light, running a stop sign and many other moving violations. In addition, if you have been on the Meadowbrook or Wantagh State Parkways you have probably noticed that the State Police have been out in full force as well. Finding an experienced traffic ticket lawyer is essential in order to protect your driving record and to keep your driving abstract points down. Points on your driver's license can lead to increased insurance premiums for years to come. If you have been issued a ticket anywhere on Long Island call the Law Office of David Galison for a Free Consultation. 516-242-4477. I have been handling all moving violations on Long Island for well over a decade. 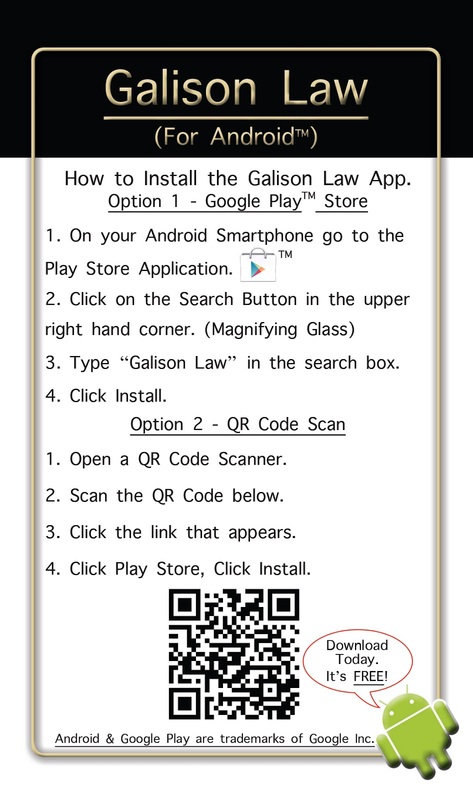 And if you have an Android device, don't forget to download the Galison Law App. 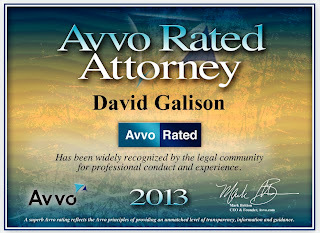 It's Free and gives you instant access to David Galison, Esq., Traffic Ticket Attorney. 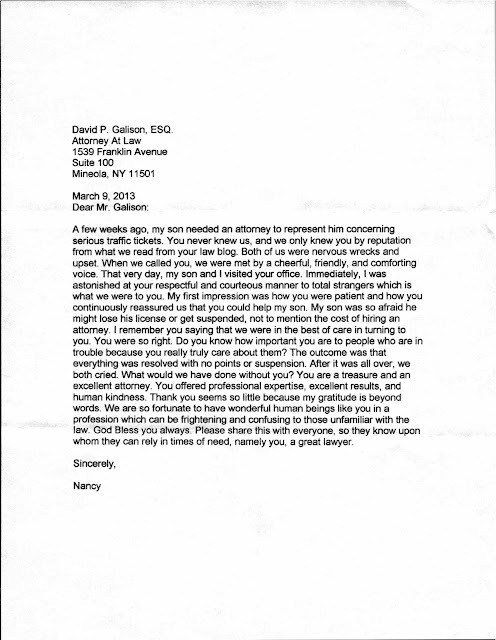 I have attached a testimonial from a recent client who had multiple traffic tickets in Nassau County, New York. The results were very good and my client asked that I share this letter. Not every case will have the same results, as each case is different. At the Law Office of David Galison, I fight traffic violations in an effort to keep your points and insurance premiums down. 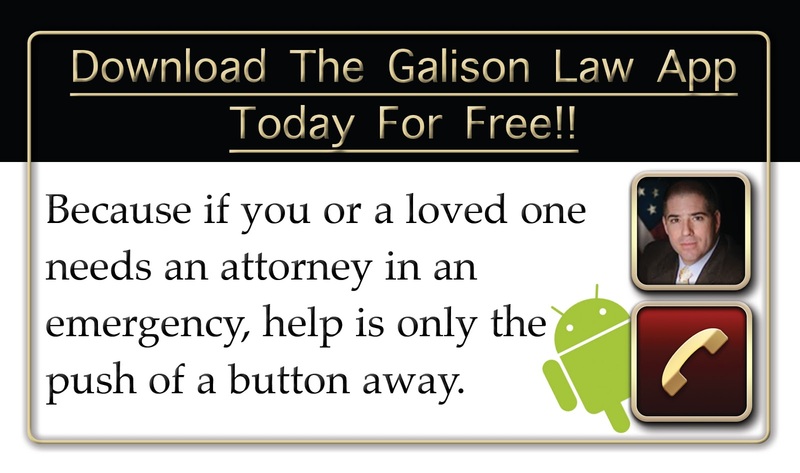 The Galison Law Application is a free download from the Google Play Store. 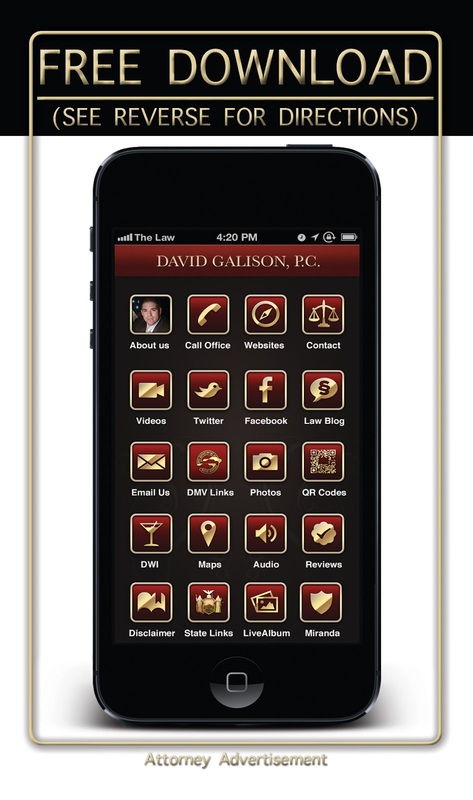 The application enables any user the ability to contact the Law Office of David Galison, P.C., in an emergency situation with just the touch of a button. If you or a loved one are arrested by the police it is reassuring to know that help is just a phone call away. 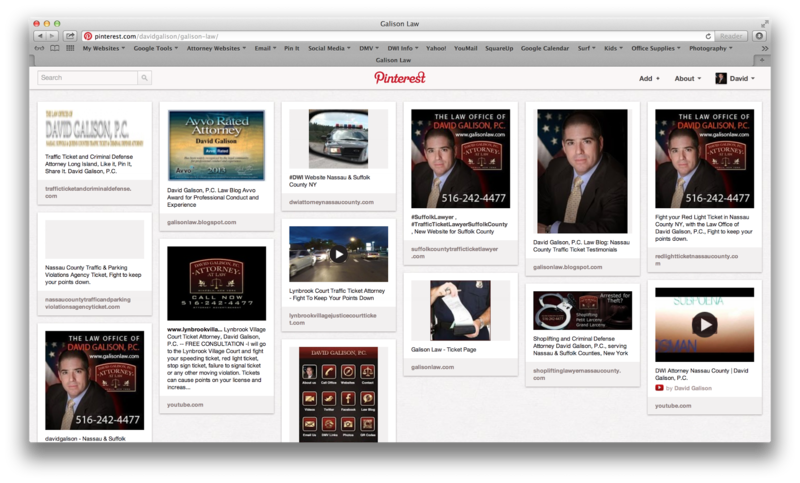 The application also provides useful information on the DWI laws in the State of New York. 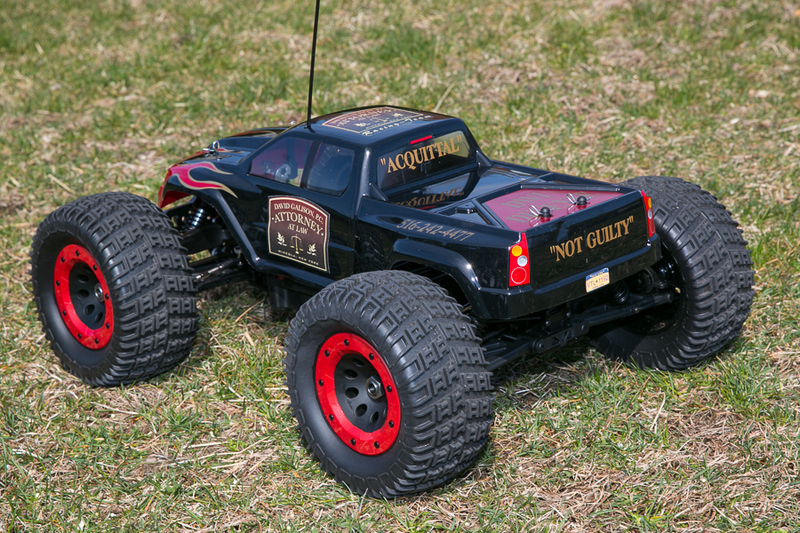 It further gives a listing of your Miranda Warnings so that you know what they are, and what to say to the police if you are ever arrested or are being questioned by the police for any reason. View recent Facebook and Twitter posting. 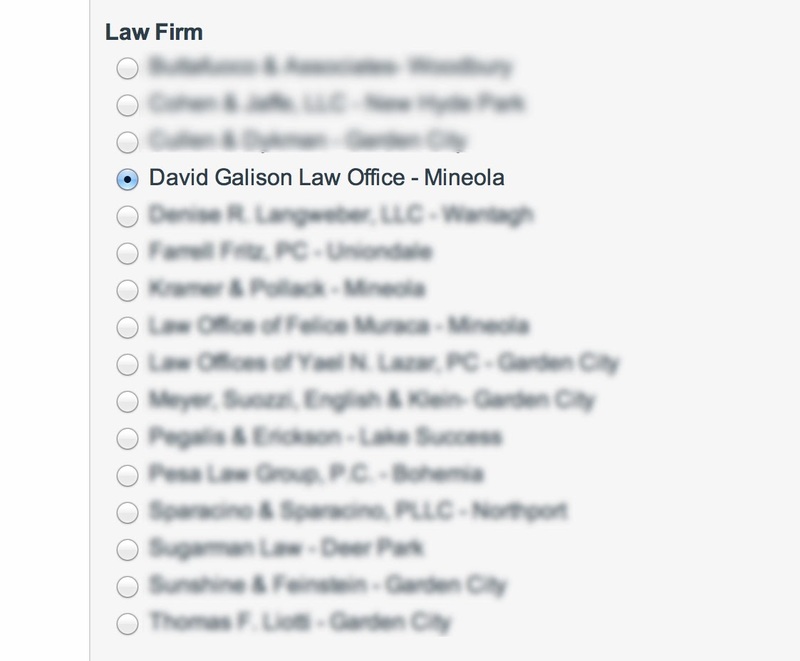 Send email to David Galison, P.C., through your smartphones. New links to important NYS DMV webpages. Access WebCrims to obtain criminal court date information. 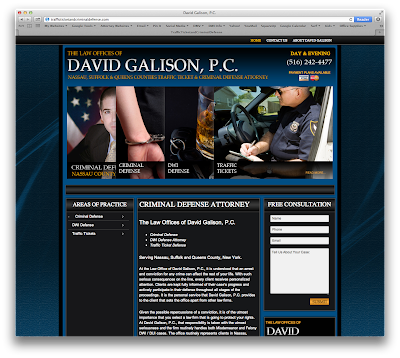 Instant access to the David Galison, P.C. law blog. 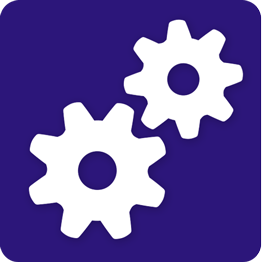 The Galison Law Application is Free and will continue to be updated with new features. David Galison, Esq., is a New York State criminal defense attorney who concentrates his practice in Nassau, Suffolk and Queens counties. 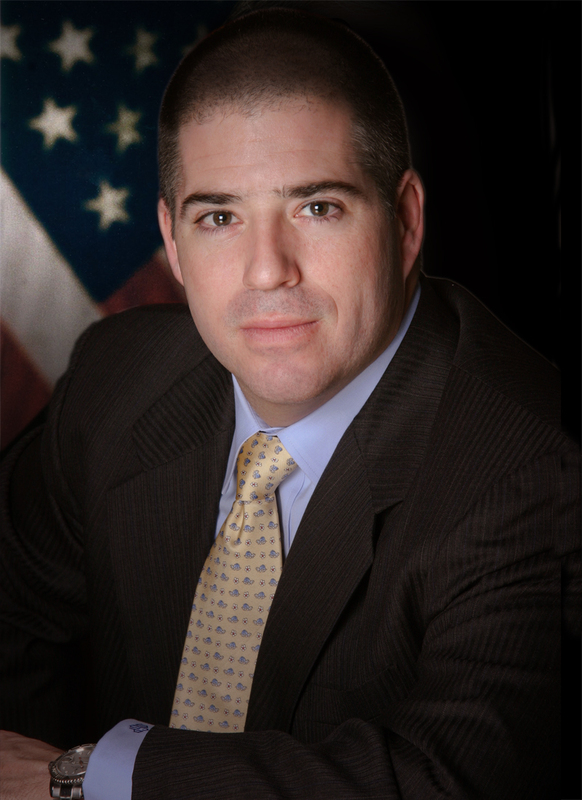 I handle all Felony and Misdemeanor cases in addition to all traffic ticket violations. In addition to substantial fines and state surcharges, traffic tickets can cause increased insurance premiums and the loss of your driving privileges. 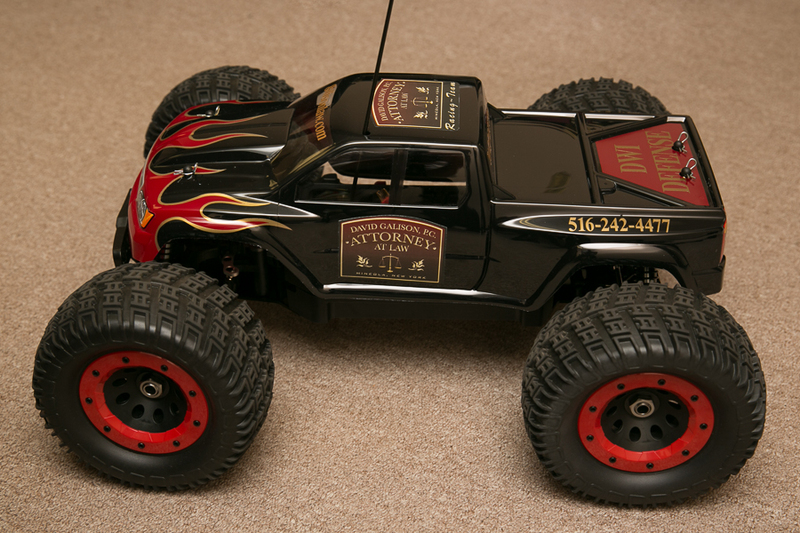 It is important to have an experienced lawyer defending you in court. In many cases an traffic ticket attorney can appear for you in court with a signed authorization thus preventing you from missing work and other important obligations. 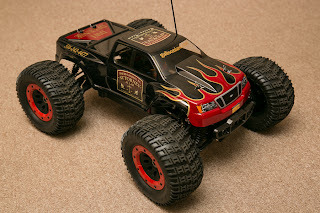 In late 2012 a client of mine was charged with a DWI with a fatality. The police indicated that my client had Red Glassy Eyes and the Odor of an Alcoholic Beverage on his breath. Three SFT (Standard Field Sobriety) test were administered to the Defendant; the Finger to Nose, Standing at Attention, and the Nine Step Walk and Turn. The police claim that positive clues for intoxication resulted from these test. 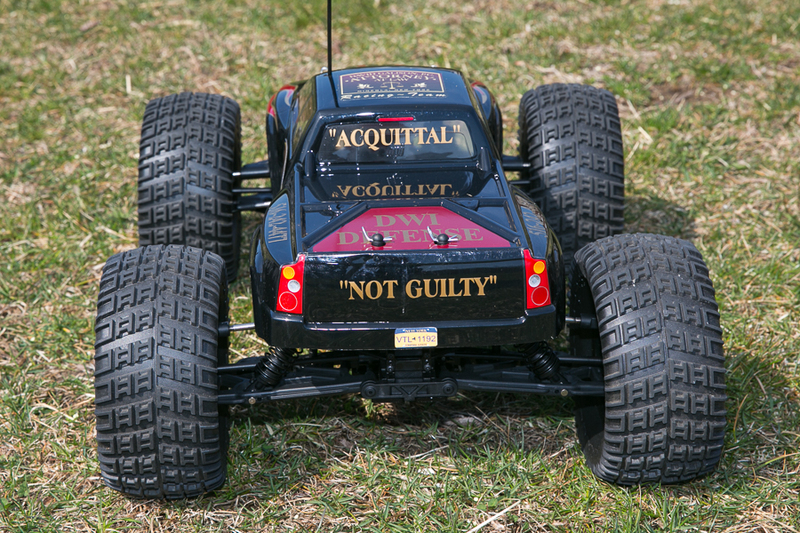 The Defendant also agreed to take a PBT (breath test) which allegedly showed alcohol in his system. The Defendant was arrested and brought for blood testing immediately thereafter. The results of two separate laboratories testing the blood? No alcohol or drugs in the Defendant's blood. That bears repeating. Zero alcohol in the Defendant's blood. As a result of the blood testing done by the Nassau University Medical Center all charges against the Defendant were dismissed by the Nassau County District Attorney's Office. So the question remains. How is it possible for a Nassau County Police Officer to swear that the Defendant had all the signs of intoxication, yet have no alcohol in his system? Was the officer mistaken, lying, looking for overtime? I don't know the answer, perhaps we will never know. But what we do know is that just because a Police Officer indicates that a person has Glassy Bloodshot Eyes, the Odor of an Alcoholic Beverage on their Breath, and claims clues of intoxication from Stand Field Sobriety Testing, that doesn't mean that the person (Defendant) was actually intoxicated. 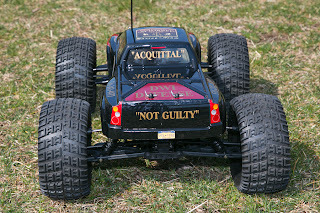 In fact in some cases the Police are 100% wrong, despite the fact that they are trained to detected intoxicated drivers.